Where is Eastside Gym located? 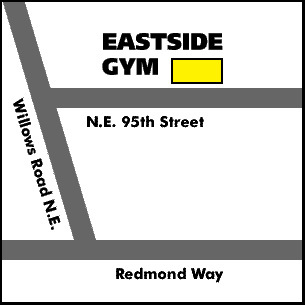 Eastside Gym is located at 15040 NE 95th Street in Redmond WA. Go down Willows Road and make a right on N.E. 95th Street. Click the 'Directions' button for the best route from your home or place of business. Yes. For more information and rates, please contact the front desk. Do you have the lowest rates in town? Is Eastside Gym a franchise gym? No. Eastside Gym is not affiliated with any chain gyms. It is an independently run gym with a "Cheers" type atmosphere. Do I have to be 18 years of age or older? No, but anyone under the age of 18 must have approval of a parent or a guardian.